Chilled yaki Nasu or grilled Japanese eggplant is a delicious and quick dish that can easily be incorporated into your Japanese meal. The eggplants are grilled with their skin intact, which makes their inner flesh sweet and tender, with a texture that practically melts in your mouth. Prior to serving, the skin of the eggplant is gently peeled off and discarded. However, the grill adds an amazing smokey flavor to the cooked eggplants which will leave you craving for more. For this recipe, I recommend using Japanese eggplant which differs from other eggplants such as the American eggplant, Thai eggplant, and Holland eggplant, among others. The Japanese eggplant has a thin skin and sweet flesh. These can usually be found at Japanese grocery stores in the West and possibly other Asian markets; however, if these are not available, either Chinese eggplant or Italian eggplant may be substituted. After the eggplants are grilled and peeled, they are cut into bite-sized pieces to either make individual appetizer plates or one-bite canapés. The eggplant is then chilled in the refrigerator for about an hour and served immediately. This dish is a wonderfully fresh summer appetizer or salad, especially during hot weather. Yaki Nasu is seasoned simply. 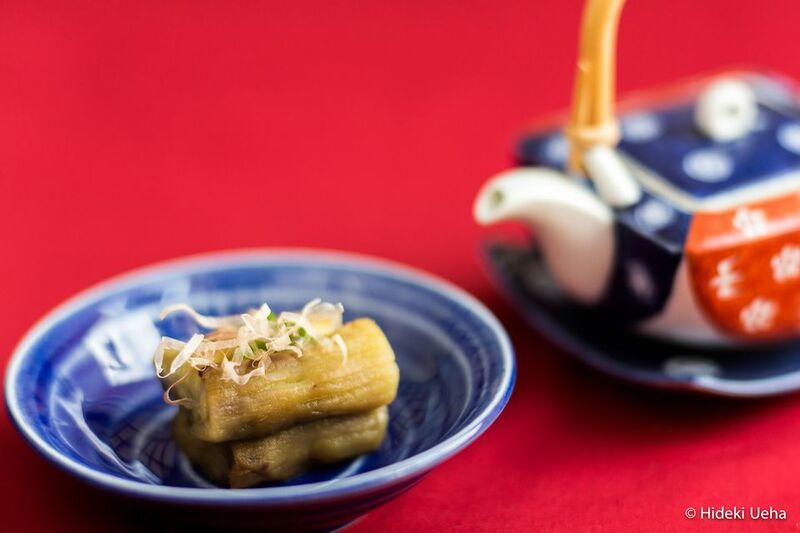 Usually, a garnish of freshly grated ginger and dried bonito flakes (katsuobushi) dress the chilled eggplant and then it is simply seasoned with a splash of soy sauce. Yaki Nasu makes for a great small dish or side salad to a Japanese meal of grilled fish or somen (thin wheat noodles). Spray outdoor BBQ grill or indoor grill pan with cooking oil. Cook eggplant skin-on over medium-high heat until the inner flesh is soft and tender and the outer skin is charred. About 6 to 7 minutes on each side. Remove from the grill and place the eggplant (skin on) on a plate and allow it to rest until room temperature. Alternatively, the eggplant (skin on) can be placed in a large bowl of cold water. Once the eggplant cools, gently remove all of the charred skin. Remove the stem, and chop the eggplant into thirds or fourths, creating small bite-size pieces. Yaki Nasu may either be served at room temperature or chilled. Chilled yaki Nasu is especially pleasant during the summer. Plate the yaki Nasu and garnish with freshly grated ginger, bonito shavings, and sliced green onions. Drizzle with soy sauce. Alternatively, yaki Nasu may be seasoned with dashi shoyu (seasoned soy sauce) or ponzu (citrus soy sauce) but soy sauce is highly recommended.